Welcome to Mistworlds LARP! Now you can literally have adventures IN the Mistworlds setting. Simple rules that are fun and exciting whether it’s your very first event or your 100th event.Mistworlds Larp was started in 2014 by Aubrey Hodges. It is based in the fantasy “Mistworlds” setting also created by Aubrey which contains a series of tabletop role playing books, a PC video game and several music albums for sale. 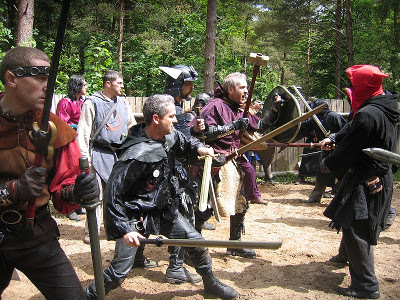 This LARP is a private club and is 100% free for it’s members. Located in Mead, CO with events in the surrounding Denver/Boulder area. We run events throughout the Denver/Boulder area. At this time all events are 1 day only. Currently we plan to run one event each calendar month – each of which can cater for basic adventurers up to experienced Heroes. We are currently seeking event sites in the area. All events so far have been hosted at Aubrey’s home in Mead, CO! The Mistworlds system is set in a specific world, the world of Veldra. You take on the role of a person – a character – in this world and for a time, live as that persona. The decisions and actions of the character are your decisions and your actions. The consequences and repercussions of those decisions and actions will follow your character from adventure to adventure. Most importantly, we want you – and everyone there – to have fun. This is true for the player characters, non-player characters (monsters) and the referees as well. The Mistworlds system is a co-operative campaign system. We assume that the characters will collaborate rather than working against each other. There is no problem with having some friction in the party – this spices things up and injects good role-playing opportunities. However, ultimately, we look for everyone to pull together against the common enemy. Also, just like in the real world, there are laws and a system of justice which are in place to provide safety and peace to the world of Veldra.